Use our Scrap.Template series to speed layout creation by pasting your favorite papers and photos into the different colored shapes (each on their own layer). 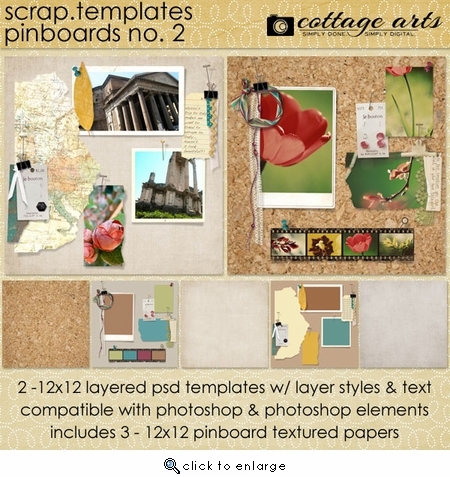 This set comes with 2 different 12x12 fabulous pinboard Page Layouts so fun for art journaling or spurring your creative juices in PSD layered format...with shadows (where needed), mats, text layers, vintage frames, ribbons, clipboard, staples, tacks, pins, lace, vintage postcard, pocket, photo masks/blocks, and accents. Some elements have lifted shadows, some have shadow layer styles that can be tweaked to your tastes. Everything on sample pages included but the photos and large map on left of second layout. This paper is available in the World Travels Page Pak. 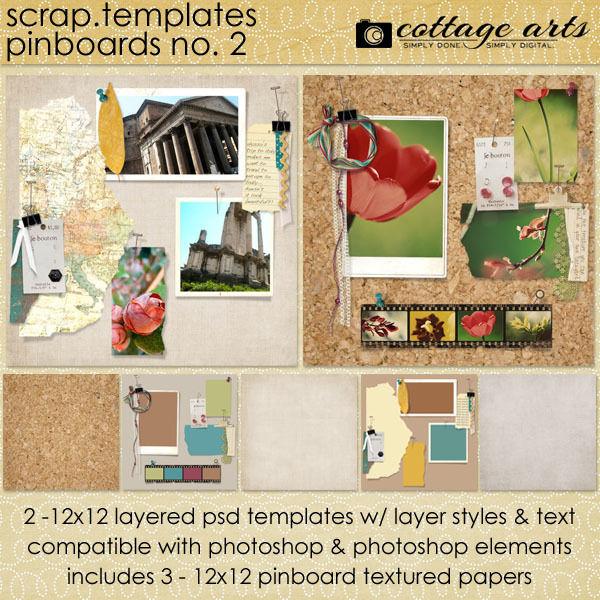 This set is unique in that it also includes 3 - 12x12 pinboard papers in cork board and linen fabric for beautiful backdrops to your creative pinboards!